On 25 September 2018, Real Madrid and Barcelona lost in La Liga on the same day for the first time since January 2015. 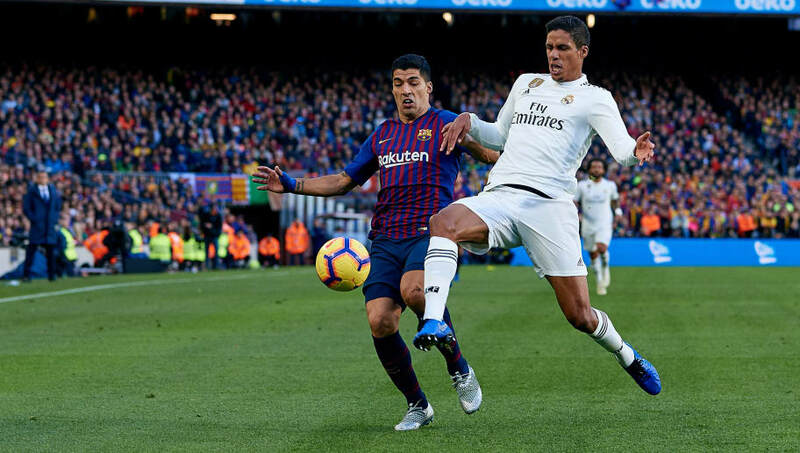 Barça threw away the lead to lose 2-1 to the division's bottom club Leganés, but Real Madrid couldn't take advantage hours later as they were thrashed 3-0 by Sevilla. The headline that Barcelona-based newspaper Mundo Deportivo ran with the next morning told the story, not only of that day but of the season in general: "Barça bad, Madrid worse." This is the unlikely story of La Liga in 2018. At a time when the gap between the rich and the poor of football has never been wider, why is one of the most financially disparate leagues in the world going against the trend and becoming increasingly unpredictable? 'Leaders, despite everything', said the front cover of Sport after ​Barcelona drew with Athletic Bilbao in September. For a club of Barcelona's standing, winning is not enough. It is expected that winning must be achieved with a certain joie de vivre (or should that be alegria de viure). It should be 'leaders, because', not 'leaders, despite'. In his attempts to win over a still sceptical fanbase, Ernesto Valverde has bought into this attitude, perhaps a bit too enthusiastically. Over €300m has been spent on adding Philippe Coutinho, ​Ousmane Dembélé and Malcom to an attack which didn't really need strengthening anyway. Even the most casual observer can see that Barcelona's real problems lie elsewhere. Recently, against Betis, ​Lionel Messi scored twice but Barcelona lost - the first time that has ever happened. These are warning signs: Barcelona cannot always rely on outscoring the opposition. But attempts to address their defensive issues have been half-hearted and unsuccessful. Yerry Mina lasted only eight months before he was sold to Everton. Clément Lenglet has had more red cards than clean sheets in La Liga so far. The latest rumours of a ​January move for 34-year-old Branislav Ivanov​ić are not exactly encouraging either. Valverde continues to put his faith in ​Gerard Piqué, a Barcelona legend but one who is clearly past his best. If Barcelona's unrivalled dominance in Spain has made them complacent, ​Real Madrid's unparalleled success in Europe has had the same effect. A combination of luck, goalkeeping howlers and dark arts contributed to a third consecutive Champions League title last season, but that only papered over the cracks. The loss of ​Cristiano Ronaldo was a potentially symbolic moment both for Real Madrid and for La Liga, as it shows Spain may be starting to lose its pulling power. Many of the Premier League’s top players, including La Liga targets like Raheem Sterling and Mohamed Salah, have signed new contracts in recent months, perhaps sensing that the power balance is shifting. Ronaldo and Zinedine Zidane leaving at the same time created a perfect storm which sent Real into a tailspin. Like Barcelona, they were not pro-active enough in the transfer window, failing to replace Ronaldo and leaving ​Karim Benzema and ​Gareth Bale to pick up the burden left behind. A five-game goal drought, unprecedented in club history, was the outcome. Real's form has picked up since Santiago Solari replaced Julen Lopetegui, but the recent defeat to Eibar showed that their problems go beyond the dugout. ​Sergio Ramos admitting that he didn't want Antonio Conte as manager because the Italian is such a hard taskmaster speaks volumes. Player power rules at the Bernabeu, their ageing stars seemingly undroppable regardless of performances. With Barcelona and Real Madrid both struggling, you would have expected ​Atléti​co Madrid to take advantage and steal a march on their rivals, but Diego Simeone's team have failed to push on from finishing second last season. Scoring goals continues to be their Achilles heel, with Antoine Griezmann finding the net just three times so far. That said, Los Rojiblancos are only three points worse off than at this stage last season, and their defensive record is the best in the league despite a horrific injury crisis which saw Diego Godin, José Giménez and Stefan Savić all out at one point. If Atlético can start being a bit more clinical, they could still be serious title contenders. At league leaders Sevilla, Pablo Machín has instilled the same attacking verve which made his Girona side one of the more exciting teams in the division last season. Over half of Sevilla's 25 goals came in three games - four at Rayo Vallecano on the opening day, six at Levante a few weeks later, and then the three against Real Madrid. In recent weeks, they've shown another side to their game, with their last four victories all coming by a single goal margin. While Barcelona are obsessed with winning 'the right way', Sevilla are content to win by any means possible, and Machín's tactical flexibility has underlined his reputation as one of the most promising young managers in Europe. Completing the top six are Alavés and Espanyol, two teams built on the foundation of a strong defence. Alavés' 17-point improvement on this time last year is the best of any team in Europe's big five leagues, and Espanyol's strong start has been inspired by Mario Hermoso, who earned a first international call-up for his commanding performances at centre back. And then you have the likes of Girona, Levante and Eibar, all punching above their weight in the top half, and all showing with their results that the fear factor of the usual giants has gone. Girona got a draw at the Nou Camp, Levante won at the Bernabeu, and Eibar thrashed Real Madrid last weekend at the Ipurua. The top teams' malaise, rather than the underdogs' form, seems to be the reason for the unpredictability of La Liga this season. Sevilla's 26 points would have put them fifth this time 12 months ago, so nobody is getting too excited about the idea of the title going to Andalusia. The table is also incredibly congested, with just six points separating Alaves in fourth and Valladolid in 13th. Long may it continue. Sevilla have dropped more points this season than the league leaders in England, France, Germany, Italy and the Netherlands combined. At a time when elite dominance is lending credibility to the idea of a European Super League, La Liga reminds us that there is no rival for an exciting domestic competition.